1The present volume originated during the International Conference “The First World War from Tripoli to Mogadishu (1911-1924),” held at Addis Ababa University from Sept. 30th - Oct. 1st 2016. The conference was organised by Addis Ababa University (AAU), the Centre français des études éthiopiennes (CFEE), the University of Macerata, the University of Pavia and the University of Roma Tre. The conference was a very exciting occasion and we are greatly indebted to all the participants. The conference enjoyed the support of the Centre de Recherches Moyen-Orient Méditerranée (CERMON, Institut National des Langues et Civilisations Orientales, INALCO, Paris), the Institute of Ethiopian Studies (IES), the Institut de recherche et d’études sur les mondes arabes et musulmans (IREMAM, Université Aix-Marseille), the Istituto Italiano di cultura of Addis Ababa (IIC). We are especially grateful to Prof. Ahmed Hassen (IES), Prof. Samuel Negash (AAU), and Francesca Amendola (IIC). During this phase, we benefitted greatly from Dr. Thomas Guindeuil’s organizational skills, at the time when he was the project manager of the CFEE. For their kindness and generosity, we would like to thank H. E. Abu Bakr Hefny, Egyptian Ambassador to Ethiopia, and H. E. Giuseppe Mistretta, former Italian Ambassador to Ethiopia. 2The editors would like to thank Dr. David Ambrosetti, the director of the CFEE, for his constant support, encouragement and enthusiasm throughout the preparatory stages of the conference and the publishing process of this volume. In Pavia, editing was done by two young and brilliant assistants, Carlotta Marchi and Arianna Tortelli. In Addis Ababa, Dr. Chloé Darmon, associate research fellow of the CFEE, has done an excellent job as the editorial secretary of this publication project. In this mission, she has been supported by Héloïse Mercier, intern at the CFEE, throughout the entire project. In Bordeaux, Bastien Miraucourt (CNRS/LAM) took in charge the final technical phase within the OpenEdition publication process. His expert intervention and his goodwill have just been crucial at this stage. 3Thanks are also due to our anonymous readers who made invaluable suggestions for improving this book and to all of the contributors to this volume for their prompt submission and patience. 4Without the support of these institutions and people neither the conference nor this book would have been possible. 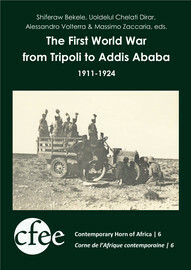 Acknowledgments In : The First World War from Tripoli to Addis Ababa (1911-1924) [en ligne]. Addis Abbeba : Centre français des études éthiopiennes, 2018 (généré le 23 avril 2019). Disponible sur Internet : <http://books.openedition.org/cfee/1320?mobile=1>. ISBN : 9791036523786. DOI : 10.4000/books.cfee.1320. Shiferaw Bekele, et al., (dir..) “Acknowledgments”. Addis Abbeba : Centre français des études éthiopiennes, 2018. Web. <http://books.openedition.org/cfee/1320?mobile=1>.